Sandy Petersen is is probably one of the biggest fans of H. P. Lovecraft. As creator and author of Call of Cthulhu as well as of the succesful boardgame Cthulhu Wars he is a big name in the game industry and his work is genre making. His son Lincoln already helped him by developing games. Now he took the lead by the news boardgame Evil High Priest. It’s now on Kickstarter. We have used the chance to interview Lincoln and Sandy about the project. Sandy, you are a huge fan of H. P. Lovecraft. If you have the possiblity to ask H.P. Lovecraft one question. What question would you ask? Well the real question obviously would be „What is the afterlife like“? If he were alive I would ask him: „What do you think of my games Cthulhu Wars & Call of Cthulhu?“ which of course I would make him play. 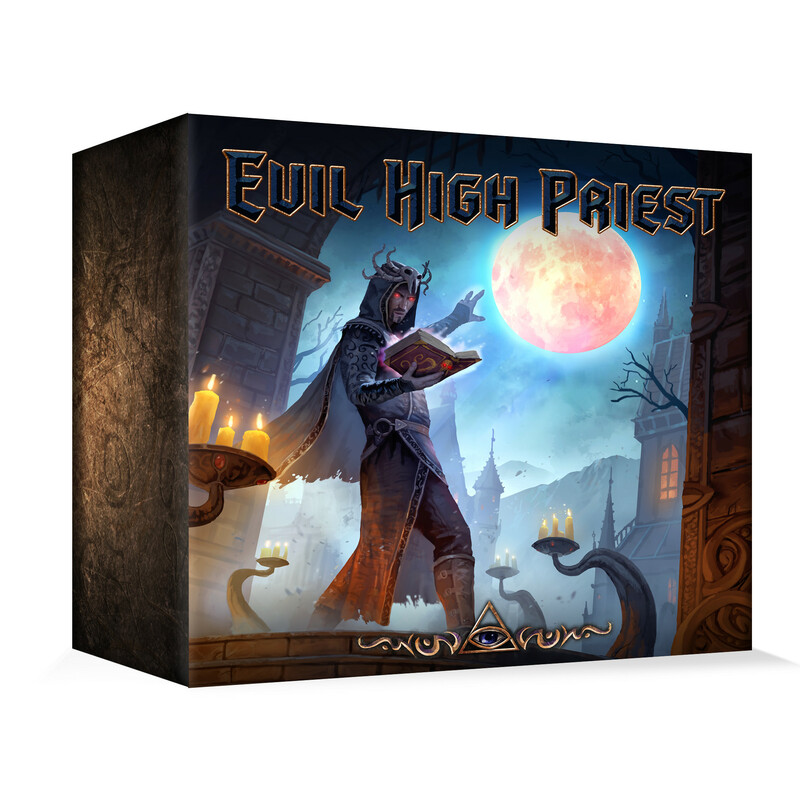 The new game Evil High Priest is on Kickstarter since Monday, November 13th. This game is about you and your fellow priests breaking elder signs to unleash your horrible god into the realm. Depending on who you worship the cult changes and how that benefits you and your fellow priests. The person who has amassed the most resources/helped the most in breaking elder signs gets to become the Evil High Priest! Remember though that only resources you have when your god awakens count towards your nomination as High Priest! Along the way though make sure you carve out your lair to protect your broken elder signs that you keep as trophies and other resources you’ve amassed against rogue investigators trying to destroy your cult! Also don’t forget to summon some monsters and create traps for those pesky investigators! It’s a worker placement game where the cult board (who the players choose to worship) changes and is extremely different from each other. It’s a co-operative effort between father and son. How do you complement each other? How does your approach differ? Sandy’s approach is more creative and mine is more analytical. My main strength is actually in playtesting and finding problems in games and finding a good solution to that problem. Sandy’s strength is coming up with super interesting themes and games to go with them. Cthulhu Wars no one before that really had a game where the Cthulhu mythos gods duked it out for supremacy over Earth. Sandy, meanwhile, you are a playable character in the board game Slaughterball. How does it feel to fight against super-athletes on a board tile? Well in high school I was never part of the „jock“ clique, so I hate those guys and love it every chance I can hammer their face into the dust. Sandy, you spent 20 years in the computer gaming industry. At the moment, board-gaming is booming in nearly every country and on the other hand Fantasy Flight Games is starting to develop own video games. What do you think about it? I feel that video games & board games serve different, but both useful functions. Video games are great when you can’t get a friend to come over, but still want to game, or only want to play for a few minutes at a time. The social aspect of board games however makes them irreplacable. In the future do you think video games are on the limit and the boom of board games goes on? Last question. Sandy, you like Cthulhu. So, what’s your worst nightmare? I have nightmares quite often. During these nightmares, I don’t like them, but when I wake up, I remember them and often use them in my game ideas. A lot of Doom levels are based on nightmares I’ve had, for instance. Believe it or not, I have never had a nightmare in which Cthulhu figured. However, Lovecraftian elements are common. One of my recurring, and quite specific nightmares, also one of the most terrifying, is for me to be in an old house (often my grandfather’s or father’s), or an old library, and to discover that there is a small secret room there. This secret room is always small, and triangular, tucked into a corner of the building. It has a clouded window shedding a nasty yellow light over the interior. There are occult-looking papers and parchments scattered over an old desk, and on the floor, and old books laying everywhere. An overpowering musty smell is all around. As I look around this strange area, I become aware of movement in the corner. I turn, and a withered, hideous undead Thing rises up – the inhabitant of the secret room. Always mummified and awful, it reaches out a blackened claw towards me. I so far have always awakened before it touched me. This nightmare is so specific (it starts out general, can be in any building, and then becomes more and more specific towards the end), that my fear is sometime it might come true. Logically I know this is impossible. But nightmares aren’t about logic.